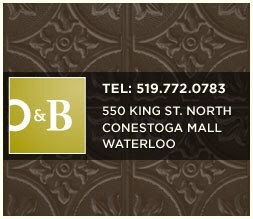 It has been 4 days now since our party of five dined out at the Oliver & Bonacini Café Grill, located at Conestoga Mall in Waterloo, Ontario and I am still pondering the experience. This is one of five O & B Café Grills in Ontario. So a chain, I guess. Not something I usually do when dining out. 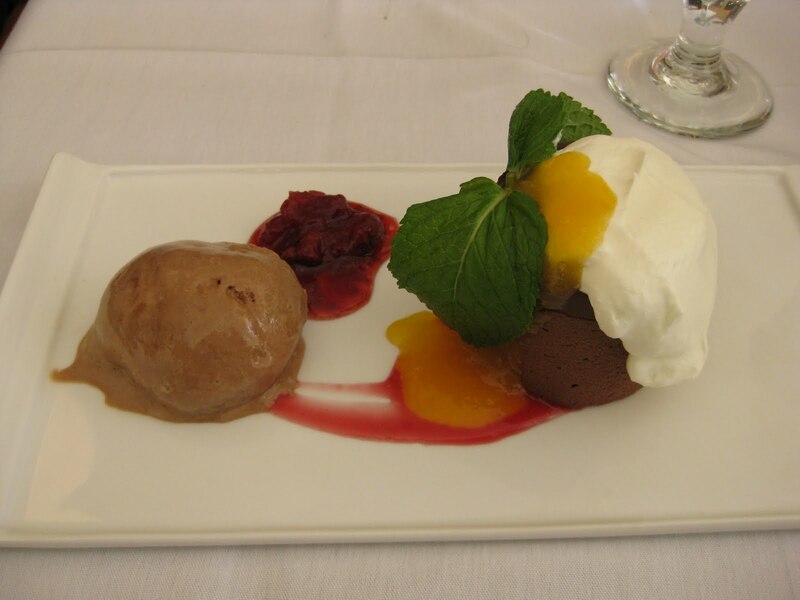 But this collection of restaurants is just five in the larger family of Peter Oliver and Michael Bonacini eateries. 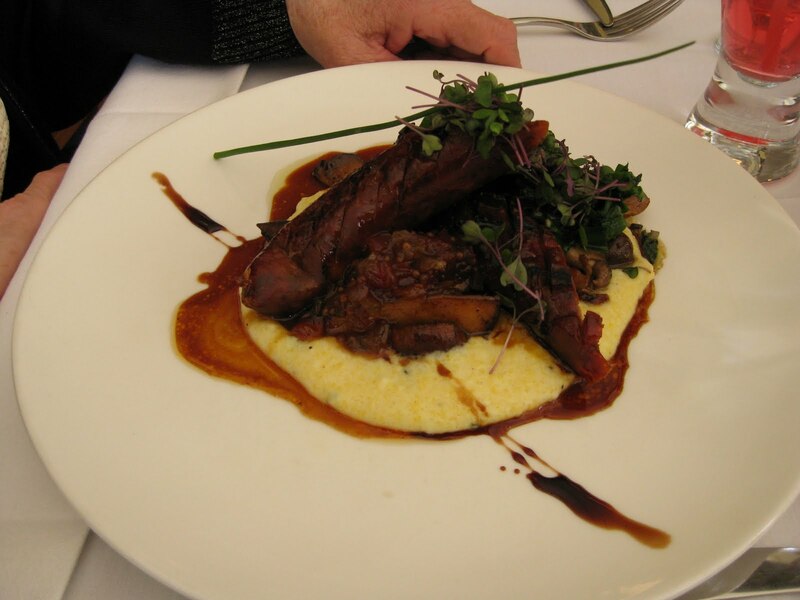 Of the other six, Canoe and Luma are the more well-known, both situated in Toronto. As I contemplated whether I would go to a ‘chain’, I acquiesced knowing it came with a pedigree. I sometimes catch a glimpse of Michael Bonacini on Citytv’s CityLine but I am most fond of his TV presence from his time on Chris Knight’s production, Cook Like A Chef. What is it with Welsh men? They are just so darn charming. And a celebrity chef so calm, cool and collected seems virtually unheard of in this industry. Shea Robinson is the Chef de Cuisine at the Waterloo location. No word on HIS disposition! With all this goodness, what could I possibly be pondering? What I can’t figure out is why Waterloo. The other Grill locations are more Toronto centric with the exception of the other outlier, Blue Mountain. And if Waterloo, then why the Conestoga Mall. And if Waterloo’s Conestoga Mall, where is everybody? I get that Kitchener-Waterloo has a high student population with two universities but surely there are enough people in the area with some okay coin to go out to dinner once in a while. Perhaps we can just chock it up to being Sunday night in a town that still closes its doors sometimes for ‘the day of rest’. For us it was a lovely evening and I just hate to see people missing out! I so hope a Waterloo presence can work for them. Annie greeted us like family on our arrival. Our service was consistent, cheery and attentive. The interior is beautiful. So many details that speak to a very urban style, not typical of restaurants I have been to in Waterloo in the past. High ceilings. Large tables. Banquettes. White and bright everywhere. Fashion forward plates. Their handicap washroom borders on posh. Check out the website gallery section to give you a better sense of the mood of this place. 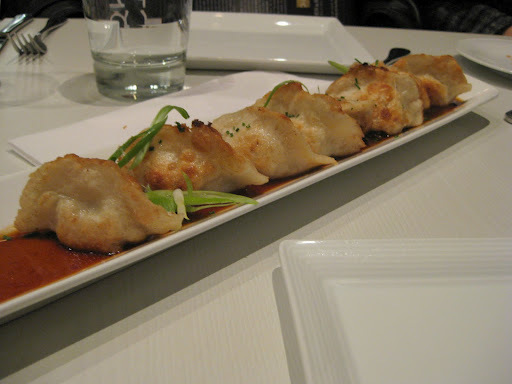 We all shared the chicken & leek potstickers with maple ponzu sauce. Lovely bundles with an asian accent. 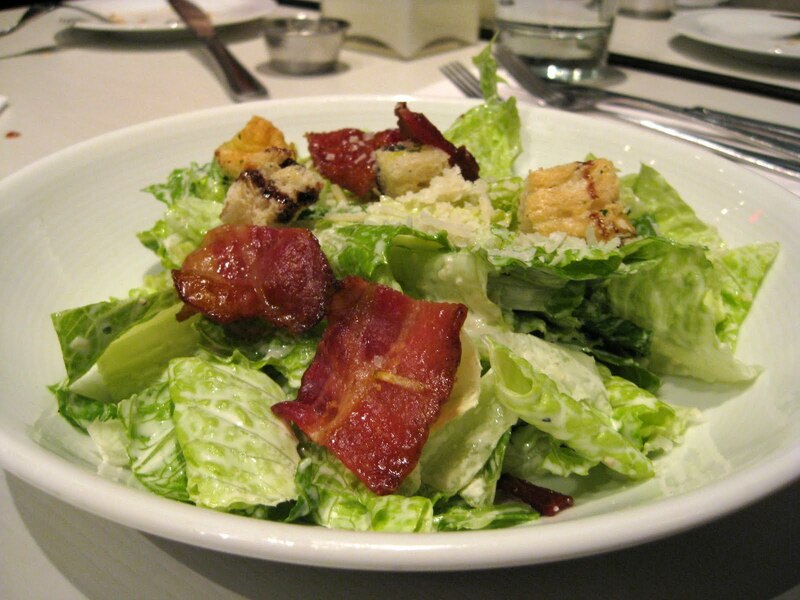 The teenager first dug into the small caesar salad with focaccia croutons, maple bacon, creamy garlic and Parmigiano-Reggiano cheese dressing. Another guest started with this dish as well. They both had the same comment – the dressing seemed diluted. He was looking for a rich garlic punch. High praise for the bacon though! 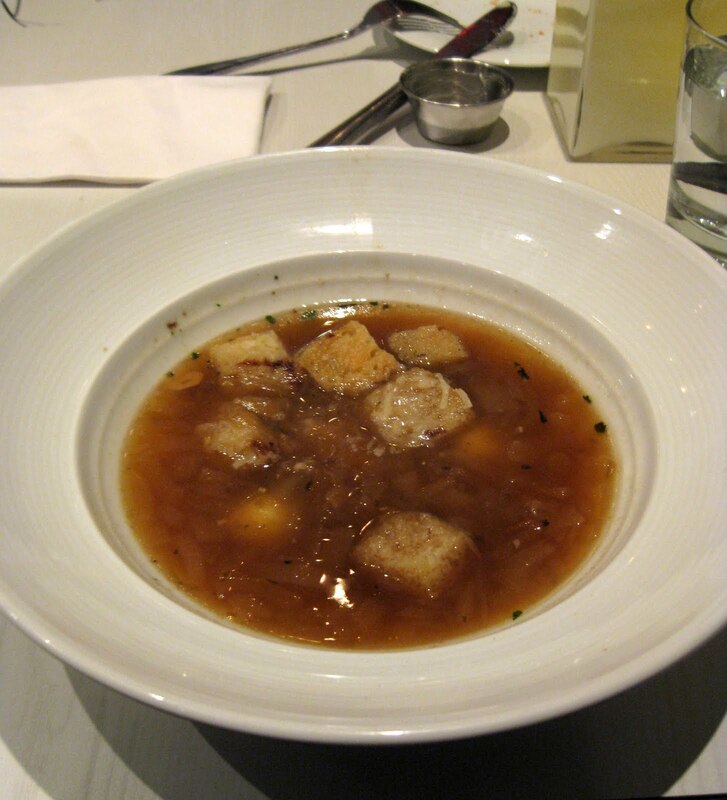 The teenager then moved on to the Tuscan onion soup with caramelized onion broth and bocconcini and Parmigiano-Reggiano cheese. 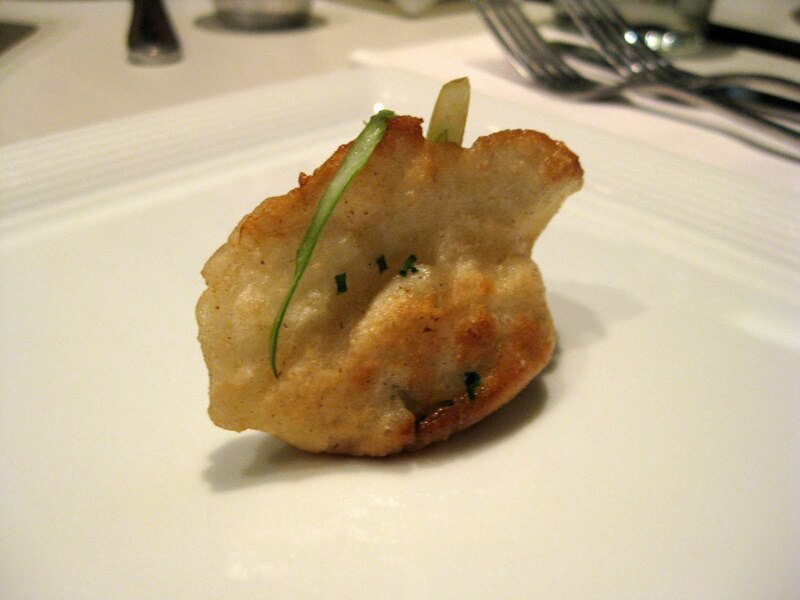 This was his favourite dish. All the onion flavour he was hoping for. He recommended it and wants to come back for more! 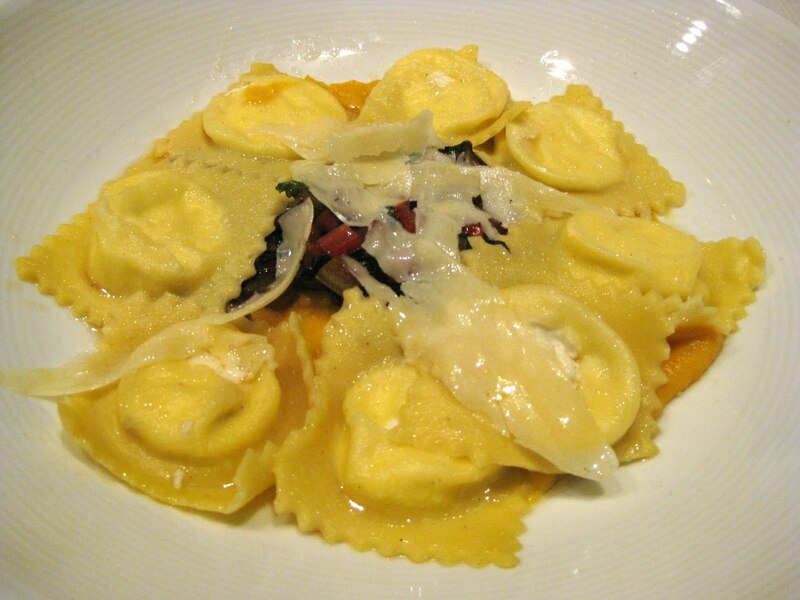 The teenager finished off with one of the November Tutta La Pasta specials – handmade ricotta and truffle ravioli with preserved lemon and garlic sautéed Swiss chard, butternut squash and rosemary brown butter. I was able to pull off a taste of this. I enjoyed the creamy filling and the squash base. But the Swiss chard was just a bit too overpowering against the very mellow ricotta and squash. High marks though for being beautifully presented. After all, we do eat with our eyes, don’t we? 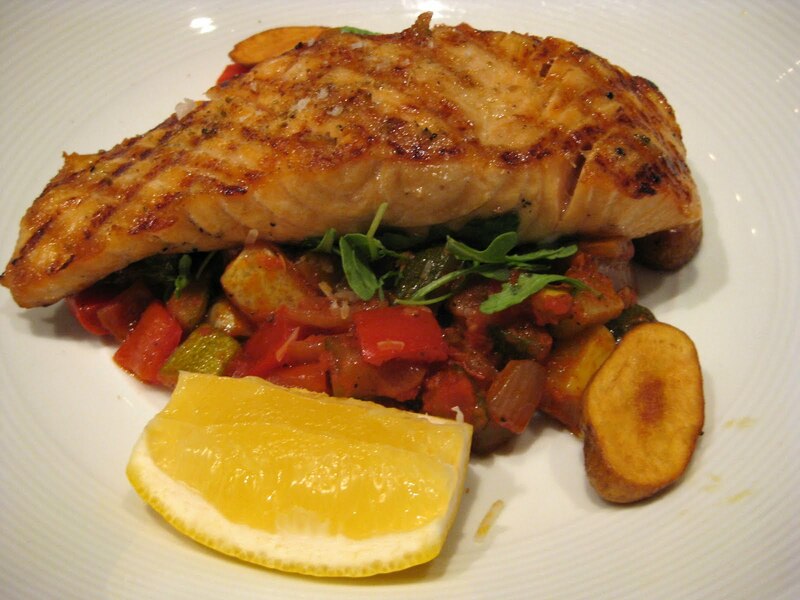 I had the grilled Atlantic salmon seasoned with olive oil, lemon, sea salt and garden herbs, served with Provençal ratatouille and thyme roasted potatoes. It was a handsome portion and the salmon was cooked to perfection. I loved every bite. The ratatouille was a good match and something I have never had with salmon before. 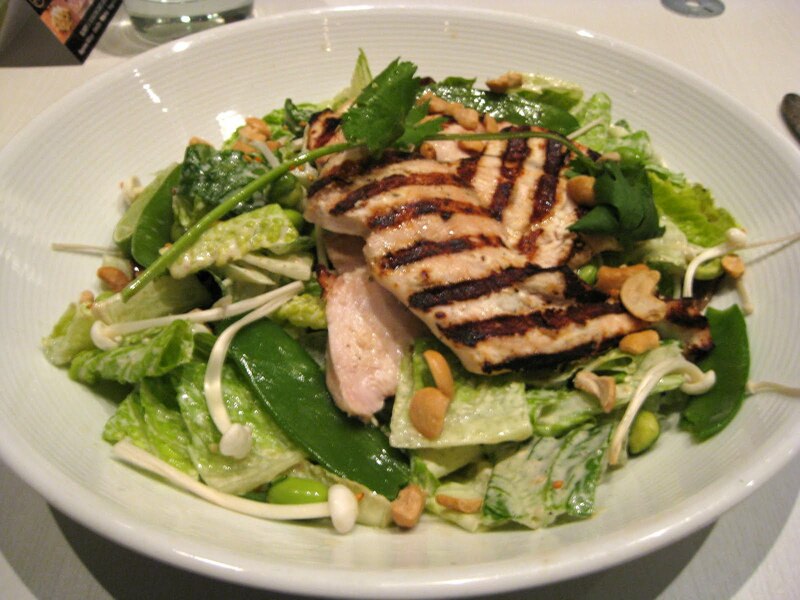 The mister had the grilled chicken on Japanese Caesar with edamame, roasted shiitake, cashews, wasabi peas, pickled ginger in a lime and soy Caesar dressing. 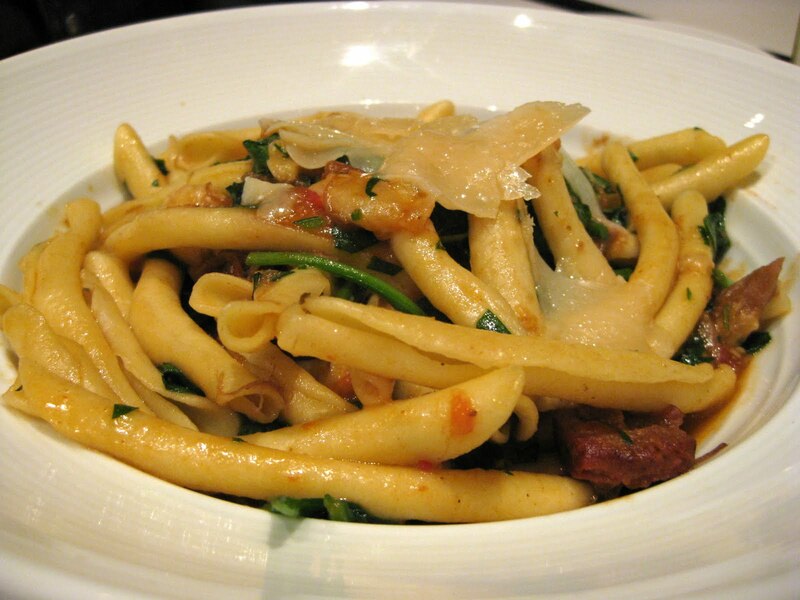 Our first dinner companion followed her Caesar salad with the strozzapreti (short hand-rolled pasta) with rosemary lamb ragout, spinach and Parmigiano-Reggiano cheese. It was an ample portion and she left most of her pasta. I suspect it overshadowed the ragout. Our second dinner companion had the fire roasted baby back ribs with jalapeño cornbread pudding, creamy coleslaw, seasonal vegetables and campfire maple baked beans. He just loved these lip smacking ribs! 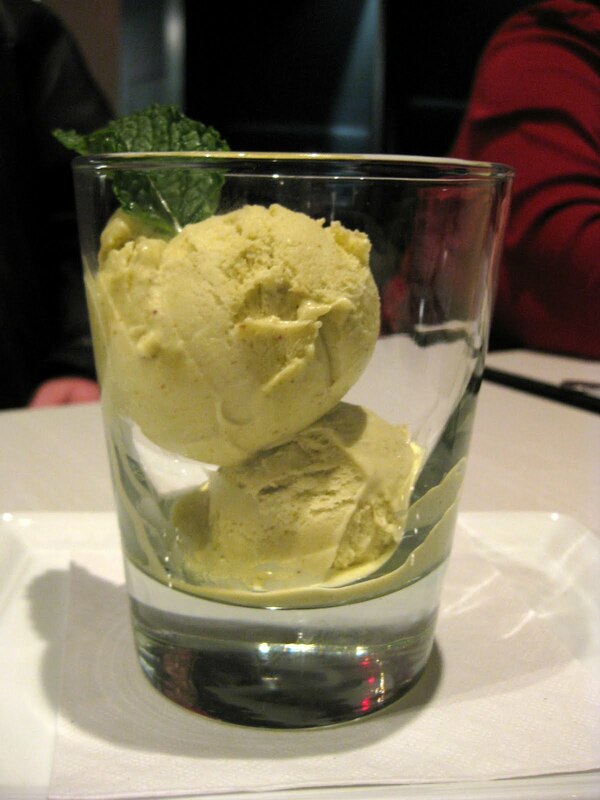 Our dinner companions shared the Sicilian pistachio ice cream. Creamy goodness! It came from SOMA Chocolatemaker in Toronto’s Historic Distillery District where artisan David Castellan makes handcrafted chocolates and gelato. 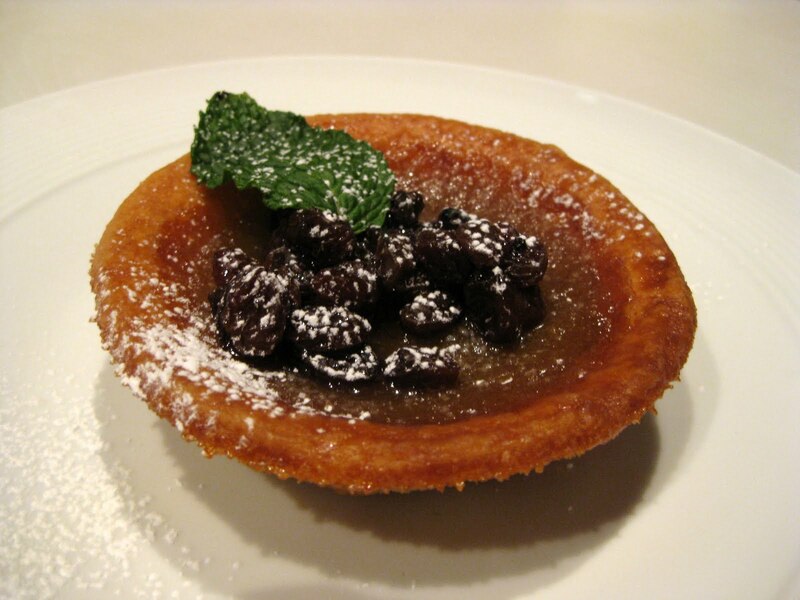 The teenager, the mister and I shared one of the O&B Tiniest Desserts – a raisin loaded butter tart. Being a bit of a butter tart connoisseur, I believe no butter tart should have more than ten raisins. I didn’t do a final tally but I know there was easily double that count. Thankfully they all sat on top so I could alter this tart to be just pure sugar pie. This probably isn’t the place to brag about my own baking prowess, but it was said by both family members that my butter tarts are better! It was still a tasty treat. 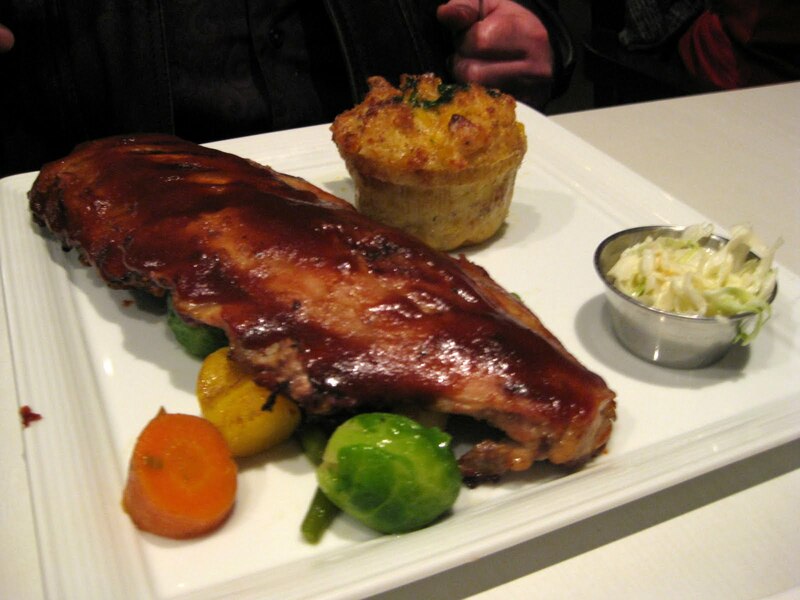 The highlights were definitely the salmon, the baby back ribs and the Tuscan onion soup. 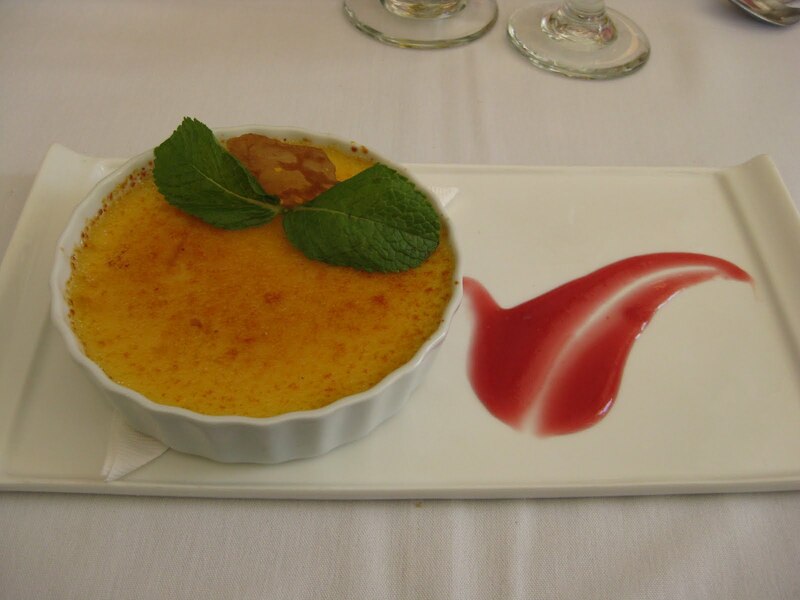 Waterloo is fortunate to have Oliver & Bonacini Café Grill in their midst. Considering the size of this region now, it needs to have a place to go for a reliable, solidly delivered meal that can serve as a ‘go-to’ place and also a destination for celebrations. 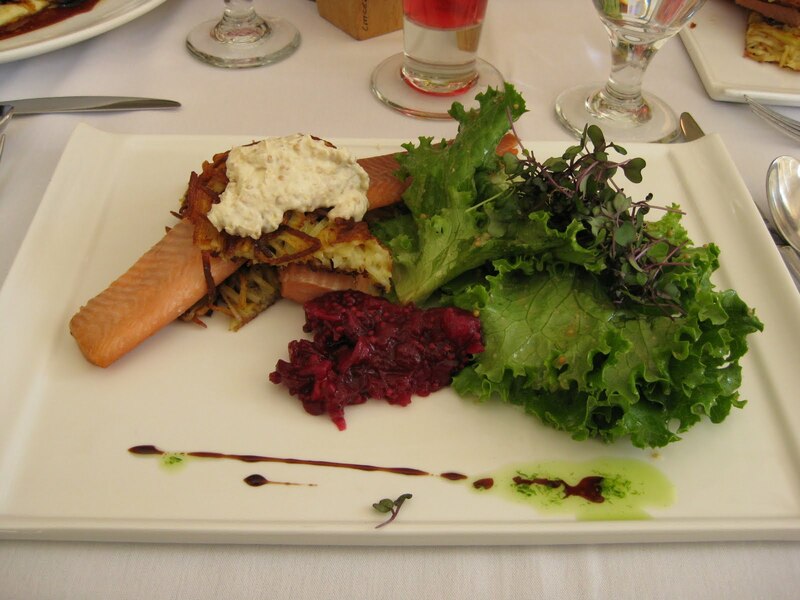 The food preparation is receiving careful attention in its preparation. The ingredients are simple and fresh. Come out and enjoy your gem. I for one would love to go back.